I had a pretty good idea of what I wanted to do for ‘vintage’ from the get go. 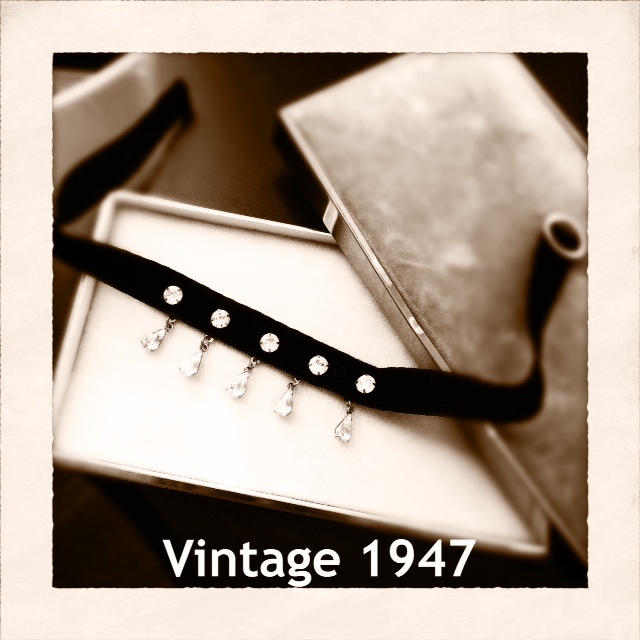 A vintage fashion item in black and white. This photo is a snapshot of a necklace my Mom wore to her senior prom back in 1947. She passed it on to my daughter two summers ago. I’m sure one day my daughter will have the perfect place to show it off. Taking advantage of the fabulous sun we have been having, I placed the choker, and the box it came in, on a small side table in front of some very large bay windows. It was about 2:00 pm and the natural light was pouring in, adding an additional sparkle to the stones. I did the majority of my edit my in Snapseed. I first cropped to a square and sharpened the details. I placed the center focus circle on the center stones and brightened within. Then I changed the pic to a contrast/neutral black and white. I ran it through Instagram, only to add some blur, and then chose the vintage frame and the Sunkiss’d effect in Camera+. To finish, I added wording in PixieTagLight. It typically takes me several times before I can line up the words correctly in PixieTagLight, but it is a free app and I use it for the familiarity. I had the same idea as Bonnie for vintage in that I chose to portray family treasures in my image. I was really dissatisfied with the first picture I posted here, so this is my redo! I have fairly modern/contemporary taste but I decided to really go all out vintage on this second attempt. In the background, you can see an old black and white photograph of my grandparents on their wedding day in 1936. 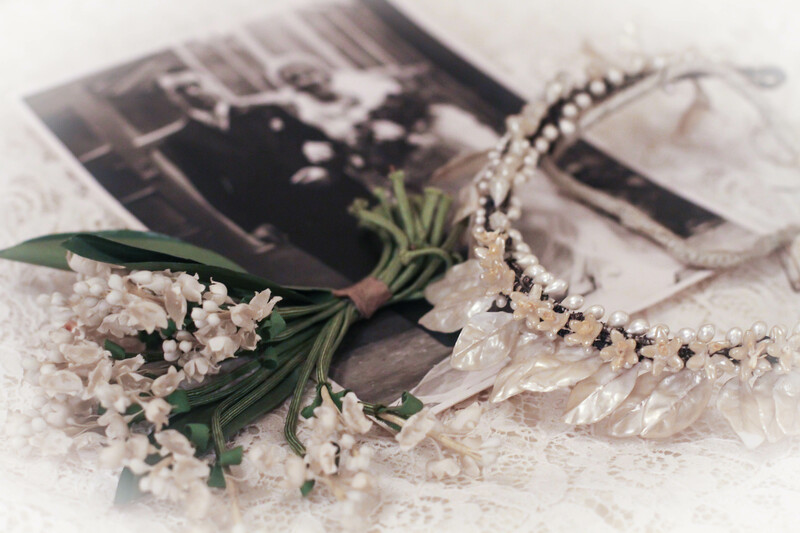 In the foreground is the headdress that my Nannan wore with her veil, and also the artificial sprig of lily-of-the-valley that she wore pinned to her dress. The significance of the flowers is that her name was Lillian, or Lily for short. The first picture I took was taken at 1:30 in the afternoon, but by the time I had decided that I just wasn’t happy with it, it was 6:30 in the evening. There was no natural light available, but I knew that any white balance issues could be corrected in Lightroom. I used a cream lace jacket on the floor of my bedroom as a backdrop and turned on the main light in the room, and a side light in front of the area I had set up. The ISO was set high at 3200, and my shutter speed was slow at 1/40, both to compensate for the lack of light. My aperture was set at f/3.5 because I wanted both the flowers and the headdress to be sharp with the photograph blurred in the background, so I placed my focal point on the area where the two objects touched and then recomposed. I made quite extensive changes in Lightroom, although it took less than 5 minutes to complete. I decreased the temperature as there was such a warm cast shed by the artificial lighting. I increased the exposure, contrast, highlights, white clipping, and clarity, and sharpened and smoothed the luminance of the image. I also decreased the red and orange tones to correct the white balance issues in the original picture. Finally, I decided to use the post-crop vignetting effect in Lightroom, which reduces the brightness in the corners of the image, and I think it produced the perfect vintage effect. Finally… I’m happy with the result! I have so loved looking at your photos and reading your thoughts behind each work. I also wanted to say thank you for letting me secretly or not so secretly borrow your photo suggestion each day. It has been an awesome way to focus on the beauty of this hectic season…I only hope you keep going for months to come! Amazing photos! I’m even more amazed that both of you have those special treasures from your ancestors! You both have a great eye for photography. I’m with Rebecca…. Amazed you have such wonderful keepsakes!!! Loved these pictures! Great way to capture forever these priceless items.